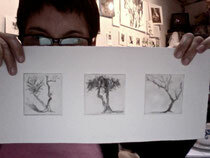 Returning to the world of intaglio inspired many new and re-newed concepts within my work. All of the formalist concerns that my work often reverts to (continually) present themselves front and center, again: Nature/Nurture, Form/Content, Positive/Negative...yadda yadda yadda! My interest in plants and trees as subject matter was a direct response to my experiences during my art making hiatus (aka: child bearing years) when my main creative outlet became gardening. The primal activities of my maternal life (feed the baby, clean the baby, love the baby) was not conducive to the esoteric whims of art making. Playing in the yard with the babies led to picking weeds, quickly followed by full on landscaping. The dialogue I developed with my garden was the same as the dialogue I have with my drawings, I'm never quite sure which one of us has the upper hand. When it came time to go back to my studio, my garden came with me. As I have been researching less toxic methods of etching the zinc plates for printmaking I have found myself back in the garden. It seems copper sulfate (with salt and water) is the mordant of choice for green printmaking. Copper sulfate is a gardening chemical (a stump killer.) How ironic, I will use stump killer to etch my trees. My other art avoiding interest is cooking, and today I discovered that pasta machines make an excellent mini printing press. This all makes my world feel so compact.